There is a story floating around Facebook today and it struck a chord with me because it took place in my home state (Kansas) and it also took place in a restaurant, the environment where I’ve earned my living for most of my 30 years in the work force. I love servers, I root for servers and Chloe Hough is no exception. A teacher friend of mine shared Chloe Hough’s Facebook status update. If I understand the timeline correctly, her last table of the night at an establishment called Boss Hawg’s Barbecue and Catering Co. was Kansas Governor Sam Brownback. She had previously given notice, last night was her last shift, so she asked friends on Facebook, what she should do or say with this opportunity. 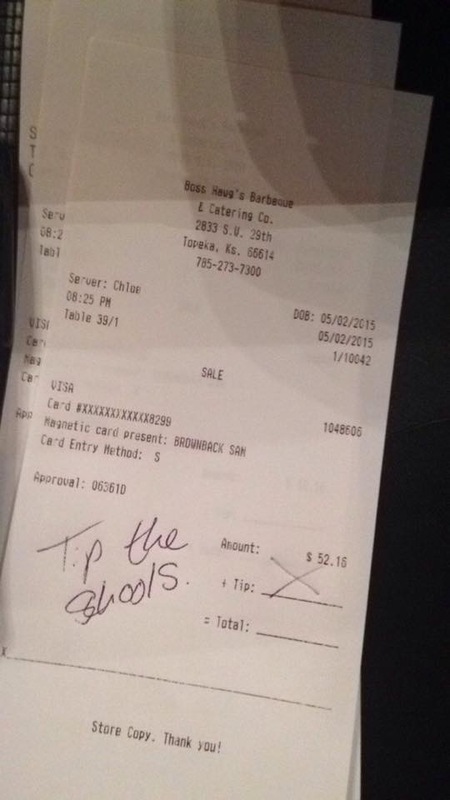 She received several suggestions, some of which, not surprisingly, were quite crude, but Chloe chose to drop the check, after running Brownback’s credit card, with the tip line crossed out and the succinct message, “Tip the Schools” written on the receipt. I don’t really know too much about the aftermath and I don’t know Chloe personally. 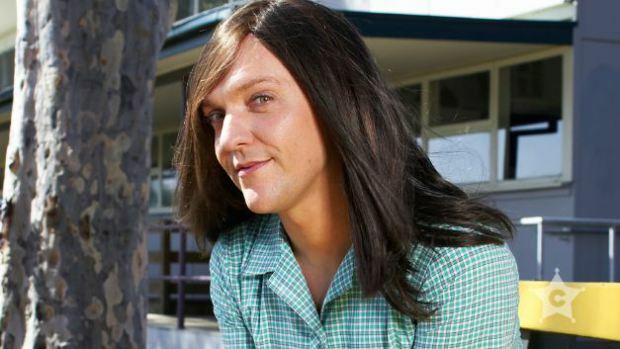 (I do love that her Facebook background picture is the character Ja’mie from Chris Lilley’s brilliant Summer Heights High. If you don’t know it, please Google it.) I did find an article on a website called kansasexposed.org where several people left comments ranging between many “you go, girl”‘s to a “what a disrespectful woman.” Kansans, like everyone else, are full of opinions. As a server who has waited on people who made my blood boil (Arnold Schwarzenegger, M.C. Hammer, Ann Coulter, to name a few) I know what it’s like to wish I could convey a message of disapproval to people whose public actions offend or negatively affect me. And goodness knows, I’ve spoken when I should have kept my mouth shut and zipped it when I should have stepped up, so sometimes it’s really only in retrospect that we know if we did the right thing. A former teacher of mine, a Kansas teacher, commented on Facebook that he thought her actions were rude. And you know, I can kind of see his point. Will this really do anything good for the state of education in Kansas? I don’t know. But let me state the obvious, I hope it does. Kansas is a funny state. Because I grew up there but have lived fairly far from there for the last 25 years, I have an interest and perspective on how the rest of the country sees the state. In simplest terms: not great. It’s a state divided over marriage equality and gun control and abortion and apparently, even education. And I do understand why the religiosity of the state creates division for many issues, but I do not understand why Brownback chooses to add anti education to his reputation. Seriously, who thinks it’s a good idea to cut funding for public schools and higher education? Of course, me being me, I’ve scoured the internet today looking for Brownback’s response. I haven’t found anything, but if you have the skinny, please send it to me. I wondered if Brownback left a tip anyway. I wondered if he embarked on a conversation with Chloe or perhaps spoke to a manager in hopes of getting her fired. I don’t know, more will be revealed. But because I am a cockeyed optimist (well, sort of) from Kansas , I choose to see this as an invitation for a conversation. You know, maybe Brownback could look at this exchange and say, “Hey, I will look at this.” Maybe what happened last night could open a dialogue and a closer look. Maybe Brownback might say, “Enough! From this day forward, I am the pro education governor. Move over “ad astra per aspera” there is a new state motto: ‘Kansas, we LOVE education. '” I could even see a Showtime TV movie with Chris Cooper as Brownback and Jennifer Lawrence as the young waitress who dared to stand up and make a difference. And I know what you’re thinking, Jennifer Lawrence is too big to do television right now and you know what, you’re probably right. It will probably have to be the girl who plays the oldest daughter on Modern Family. But still, anything is possible. So, I say, you go, Chloe! You made my day and I hope that Brownback takes your message in the spirit of constructive criticism and I hope all of this brings good things not just to you, but also to a state I love, a state I will always call home. Through hardships to the stars. So, I’ve reentered the workforce. And not only am I back at a restaurant, I’ve returned to waiting tables after a few years away. I feel a little old and a little slow, but I genuinely like the people I work with and for and the food is amazing. Turns out, I like being around delicious food. There is another thing I like about working in a restaurant, it’s not confined to restaurant environments, but it is a trademark. It’s when you start talking to a person, a customer, a client, a guest, whatever you’re asked to call the person and you start talking about what’s good on the menu and you somehow transition to talking about where you grew up or what you love/hate/love about LA or what are you passionate about. A few nights ago, I waited on two women. I asked them where they lived, they told me. One of them lives in Venice. “Born and raised,” she told me. I asked her if she’d seen the exhibit about Venice Beach that’s at LACMA right now. She told me she had not seen it and I told her she must. She asked me where I was from. Kansas. Then she asked me when was the first time I saw the ocean. I paused. 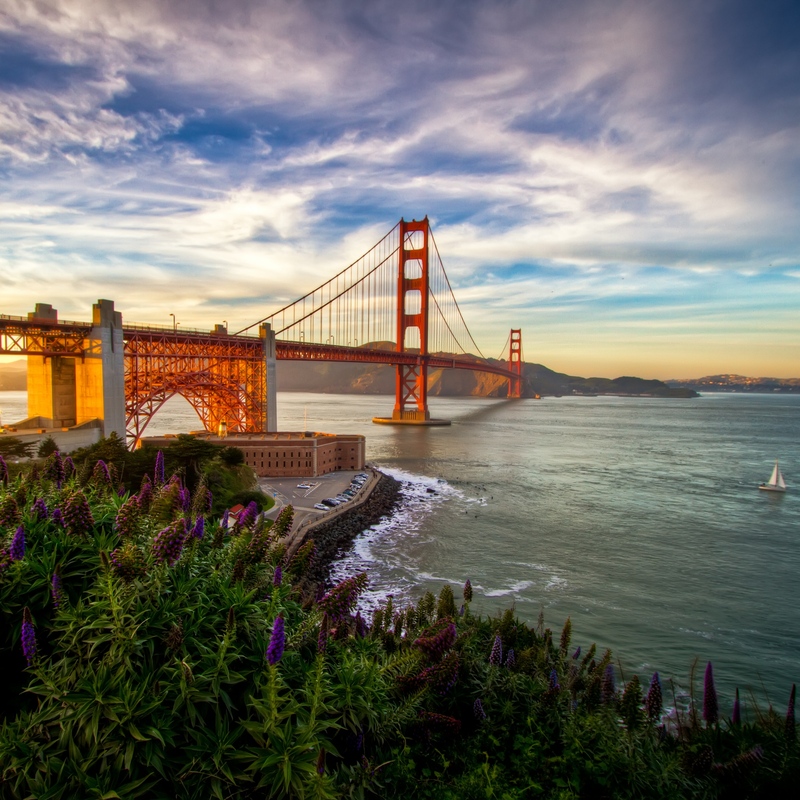 Although it’s not a question one often gets asked, suddenly, I was 12 years old, on my first 747, seeing the ocean from my window seat as our plane prepared to land at San Francisco Airport, a stop on my family’s trip to Hawaii. As I told this to these ladies, the hair on my arms stood up, reliving one of the most exciting moments in my life up to that point. Memories flooded back. I told them how Blondie’s The Tide is High was playing on the airplane’s radio playlist and I couldn’t figure out if the synchronization was random or orchestrated. To this day, I still don’t know, but every time I hear The Tide is High, I think about that sight. I live 14 miles from the Pacific Ocean. I sometimes see it several times in a week. It’s also not rare for me to go months without seeing it. But every time I go through that tunnel that drops you onto PCH and I see that beach and that water, it thrills me. I just never get tired of it. I tell myself, one of these days, I’m moving to the beach. And maybe I will, maybe I won’t. When I lived in New York, I lived near the Atlantic Ocean, blocks from the Hudson River and I would see the water almost every day. During my San Francisco days, I could run from my apartment, through Golden Gate Park, all the way to Ocean Beach. I don’t have to see the ocean every day, but I like knowing it’s there. When I go to Kansas, I actually get a little nervous, a little itchy thinking about how far I am from the ocean. Weird, I know, but it’s the truth. I’m not the only land locked Midwesterner who followed the siren song of the ocean to a coastal city. Los Angeles is full of people like me. It’s even full of waiters like me. As much as I feel that tv and movies and that Hollywood illusion called to me from my living room floor, eyes and heart glued to the tv set, there is something about the geography that beckoned me too. Like the end of Inside Daisy Clover, when Natalie Wood barefooted it down the beach after her shanty exploded in flames. Or Jim Rockford’s trailer in Malibu. And even though we never saw them go there, except in the opening credits, we knew that Jack and Janet and Chrissy’s apartment was mere steps from Santa Monica Beach. They did not have to actually go there, for us to know it was there. Father’s Day is about families. Mother’s Day and Father’s Day, I spent with the friends who became family because we all worked together, at Barney Greengrass. As many of you know, Thursday was the last day of operation for the Beverly Hills restaurant, Friday was my last day of work. It’s been a bittersweet time. Laughs, tears, all of it. I asked my good friend Barbara if she wanted to write a little something about our journey, her journey. We started within months of each other in 1999 and I count her among the greatest gifts from working there. If you were part of the ride, you will understand especially, but even if you never set foot inside the place, it’s a story of endings and new chapters and looking back, while still the memory is fresh, that anyone can relate to. I am lost. I have nowhere to go. I don’t know who I am, or what I do. As in, I feel like I lost my identity. What I used to do? I managed Barneys New York Restaurant, and it has now seemingly (though it was anything but) come to an abrupt halt. “Barneys New York Restaurant, formerly Barney Greengrass, will be closing for renovations, to reopen in the fall as Fred’s. In keeping with the Barney’s brand.” I have said this so many times over the past four months I thought I wouldn’t be able to mouth the words and speak it again. It is a true statement: it is also a script. I am taking Ray up on his generous offer to finally go off script. My displacement, oddly enough, didn’t happen when the people left. I thought I was weird for not being upset. I hugged them goodbye, when I had the time, I shared anecdotes, when I had the time, and once, with one friend, because I had even a little bit more time, I told her she was one of my favorites because she was. Rather, my utter sense of loss began yesterday and culminated today when, of all things, the stupid furniture and the food were finally heaved and hauled out of there, all of it donated to charity, and, in one final act of good will, what was left of the food bagged and placed downstairs for everyone to come and “shop” as they joked, like a farmer’s market. I took my box of assorted goods someone prepared for me. I knew I wouldn’t eat most of it. I just couldn’t leave without it. It seemed such collective act of parting, like leaving a great dinner party, making sure everyone had something when they left. Only now, tonight, do I think I know what happened to me. I think the people I worked wiith over the years, are so real to me, so vivid, so clearly a part of me and my life, who I am and what I really do, that they didn’t seem gone until all the props of the setting were gone. What do they call that, “strike the set”? 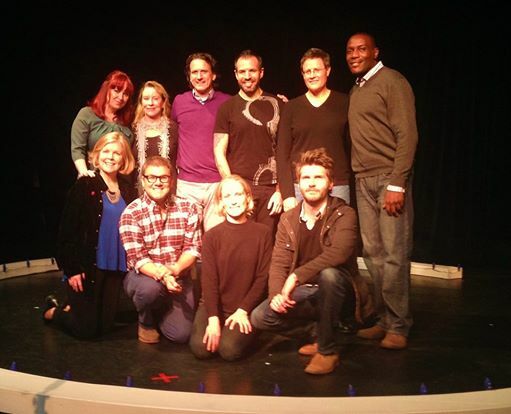 They struck the set; the show was over, and with it, some of the best moments and times of my life. Empty and stark, it finally hit me that no one is coming back. Off everyone goes, they’ll get another part, we’ll all come see each other, but as I sit here now, silly fool, all alone crying by myself about missing, in no particular order, the cast and crew, Art, Ray, Vinod & Sean G., Florence, Kristin, Olya, Rudy, Jonathan M., Ian, Jamal, Alejandro, Gabe, Tino, Jacobo, Bayron, Mark, Oscar, Eli, Miguel, Mario, Flaco, Jonathan C., Oscar G., Juan H., Juan Pablo, Ruben, Juston, Diego, Brian, Jon V., Megan, Dawn, Cathy, Ben, Joy, Earl, Vanessa, Margie, Sharyn, Skye, Keith, Blake, Joey, Jennifer, Jennifer K., Robert, Roberto, Edgar, George, Andrea, Conrad, Christian, Kevin, Loriann, Marie, Matt, Bob R., Max., (forgive me if I missed anyone), I know what a hell of a job we did, how many people we affected and moved, together, as a cast of incredible characters. We had a long run, some recast over and over again, some of us staying the whole time, and we were really something! Let’s face it guys, the people loved us! The proverbial “Barney’s Show” – had it all: the drama, the laughs, the births and even the death of our beloved Art. Some days, some of us weren’t quite able to play our parts, because we all had to flip a switch and perform at work, but we stood in, helped out, took over, supported each other through it. Needless to say, sometimes we had a tough audience. So we performed for each other! But sometimes they cheered for our little troop, and we basked in the praise; yes, we took pride in doing a good job because that is the kind of saps we are. I left the dark stage today in a sad mood because I deeply miss my friends, on stage and off stage. I can’t say enough about the people I worked with. I will do this job again, no doubt, but for me, plays like this one, parts like this one only come along once in a lifetime, and I am so very grateful for it. By the end, I knew it by heart, by my heart. I am currently reading a book called The Grand Surprise. It is the journals and letters of a man named Leo Lerman with biographical information interwoven, edited by Stephen Pascal. Lerman was a writer, critic and editor, but he was also known for the regular salons he held at his home on the Upper East Side which included the likes of Truman Capote, Carson McCullers, Christopher Isherwood, Peggy Guggenheim, Diana Vreeland, etc. He died in 1994 at 80 and even though I’m only on page 77, 1949, I can tell he lived a rich, full, life. I just finished reading George Plimpton’s Truman Capote biography and Leo Lerman is one of the hundreds of people interviewed for that book. As much as I love reading Capote’s work, the more I read about him, the more I think I probably would not have liked him if I’d known him. Well, maybe I would have liked him, but he would have been one of those friends I would have to keep at a distance. He could never be a confidante or a person to depend on in a crisis. Lerman, on the other hand, seems to me, a kindred spirit. What I’ve read so far, journals and letters from his 20s and 30s, are about loneliness, vocational directionlessness, romantic complications, frustration and judgment about being overweight, all things that resonate with the 20s and 30s incarnation of myself and are likely to be themes, to some extent, for the rest of my days. And, like me at 28 or 32 or 38, the one thing he knows he has are good friends to share his life with. There is something about Lerman that I recognize, something also, that I love. Would we be friends in real life? Perhaps, perhaps not. I need an escape from my real life at the moment. Between Capote and The Grand Surprise, I’ve enjoyed spending time in mid 20th century New York City. My job of 15 years is ending next week. 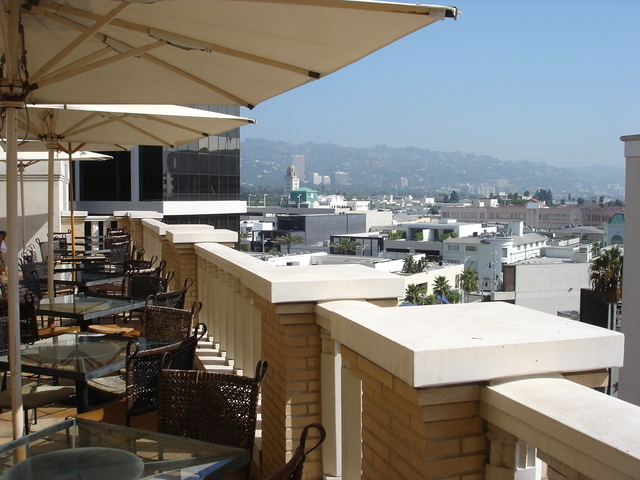 I’ve worked in the same restaurant, a high end lunch spot in Beverly Hills that caters to Los Angeles’ wealthy, since 1999. I started when I was 30, it’s been 1/3 of my entire life. The restaurant will reopen in a few months with a new identity, a new name, a new menu. I could very well be back and also, in the intervening months, something else might come up. Still, it’s an end to a time of my life and it’s bittersweet. I suspect that in the future I will write more about this ending of one and beginning of another chapter in my life, but right now, when I start to write, I find I have no perspective. I have no idea what the weeks ahead hold for me. Which is kind of exciting, but also a little scary. So, perhaps, one can understand, why I’ve buried myself in these thick books about charismatic gay men from another time. I close my eyes and imagine throwing intimate gatherings in my living room where all that is served is a jug of cheap wine and a big block of cheddar and everyone sits and gabs and laughs and drinks and eats. We all drink too much and talk too loudly and passionately and later, when I’m cleaning up the remains, I think to myself, my, aren’t we the smart ones!? 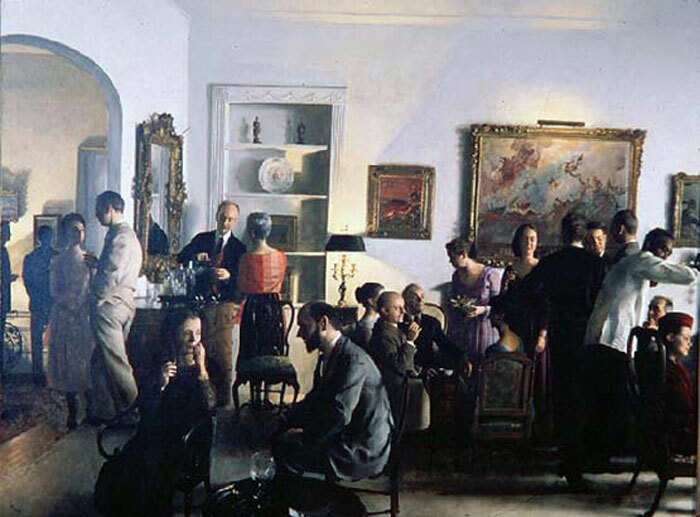 The accompanying picture is a painting by John Koch. Leo Lerman is in the foreground, conversing with pianist Ania Dorfmann. The artist is the lean, bespectacled fellow mixing drinks at the bar. He is somewhat famous for another painting called the The Sculptor which I wrote about many months ago, back when this blog was new.